Free University's set up in Madison Square Park is just downtown from the original Free Academy of the City of New York, which was founded in 1847 as a completely tuition-free school. How do you solve a problem like the American higher education system? Rising tuition costs, lifelong student debt and the increasing occurrence of undercompensated adjunct labor are just some of the factors lifting university education further and further out of reach for many. This week, the Free University is engaging in “an experiment in radical education and an attempt to create education as it ought to be,” according to the description on its website. 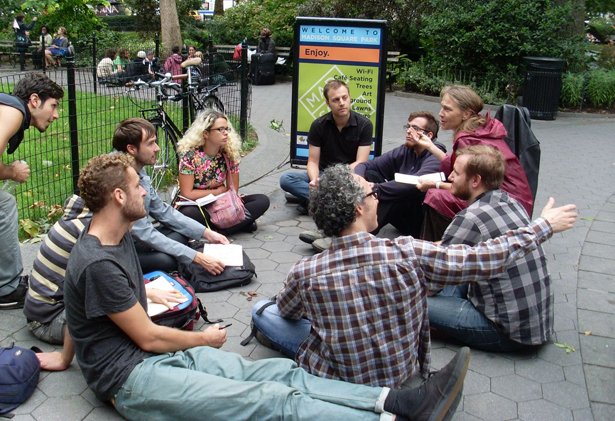 They’ve begun by transforming a patch of Manhattan’s Madison Square Park into an open-air, collectively-run university of sorts, where “horizontal learning” replaces traditional professor-student hierarchies and top-down educational models. Workshop facilitator and Brooklyn College student Emma Francis Synder described the project as “a prefigurative learning space outside of the institution,” where anyone can teach, and anyone can learn. On Tuesday morning, a group of around ten students gathered for the first session of the day. With classes, workshops and skillshares on topics as varied as the carceral state (with Critical Resistance co-founder Ruth Wilson Gilmore), police violence, screen printing, the BDS movement and yoga, over 140 sessions will take place over the five-day period. Professors such as Kyra Gaunt Baruch College, CUNY plan to conduct their scheduled classes in the park. This is Free University’s fourth event since May Day, with a few less ambitious events in Washington Square Park and the Brooklyn neighborhood of Bedford-Stuyvesant in past months. Originally conceived in the CUNY Graduate Center General Assembly as a strike action in protest of CUNY tuition hikes, organizers view its scope as extending much wider, informed by student movements in Greece, Spain, Mexico and the Arab Spring, says organizer and Graduate Center student Dominique Nisperos. That it follows so closely in the wake of Occupy Wall Street’s first anniversary is no coincidence, although organizers are quick to point out that this is a separate project—more of an “offshoot” of Occupy that hopes to “provide momentum” after the happenings of May Day and S17, said Galvan. Free University’s site in Madison Square Park is just downtown from the original Free Academy of the City of New York, which was founded in 1847 as a completely tuition-free school. Now called City College, it eventually became a fee-charging CUNY. A sense of heritage perhaps lingers at Free University—CUNY students are by far the most represented in the organizing group that includes, in smaller number, people from NYU, Columbia, Empire State College and the New School. For Nisperos, the project is a testament to the belief that “education is something we can all take part in, control, and produce.” This week’s events in Madison Square Park are providing one opportunity to do so. The Free University of New York City runs Tuesday, September 18 to Friday, September 21 from 2pm to 7pm and on Saturday, September 22 from 10am to 2pm in Madison Square Park. The full schedule for the week’s events is available here. The next organizing meeting, on September 30 from 3:30-5:00pm at the Teresa Lang Center at the New School, is open to the public. Anna RobinsonAnna Robinson is a fall 2012 Nation Books intern.